Prince Amyn Aga Khan presents 200,000 euros to acquire Sequeira masterpiece ‘Adoration of the Magi’ securing Portuguese cultura | Ismaili.NET - Heritage F.I.E.L.D. – Prince Amyn Aga Khan, Personal Representative of His Highness Prince Karim Aga Khan. With this contribution, the Aga Khan Foundation becomes the main donor to the initiative launched by the prestigious Portuguese art gallery, member of the Spanish Prado Museum. Now the contribution of 200,000 euros made ​​by the Aga Khan Foundation has relaunched the campaign, said Portuguese media reports. To understand the importance of this contribution, it is important to note that its size corresponds to one-third of the total . That is, the value equals to what was collected to date and makes the total collected exceed the 400,000 barrier, perhaps the example of the Aga Khan Foundation will also succeed as a motivating aspect of the campaign, added media officials. 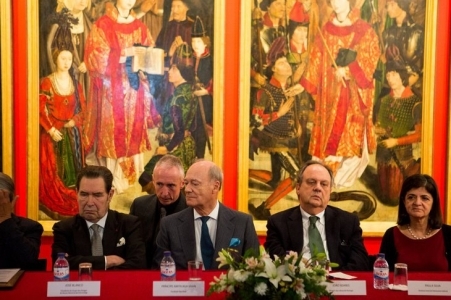 “It’s a very generous contribution, equivalent to one-third of the value of the painting, and whose scale speaks for itself, made on behalf of the Aga Khan Foundation and the Ismaili community throughout the world, and also in Portugal. … is very significant and symbolic … highlighting the ecumenical spirit of the foundation to support a painting that reflects the cross between two worlds. Launched last October 27 and in force until on 30 April, the initiative aims at the acquisition of the painting “The Adoration of the Magi”, by Portuguese artist Domingos António de Sequeira (1768-1837), one of the great figures of the generation of Goya. Painted in Rome in 1828, the table shows the encounter of the Magi with Jesus after his birth, in a composition where the light is the key element. The Aga Khan Foundation considers supporting this initiative and a relevant integration of this “national treasure” in equity with the Portuguese State, it said in a statement. The Aga Khan Foundation (AKF) is part of the Aga Khan Development Network (AKDN), present in several countries, whose mission is economic, social and cultural development, and has a more than $ 650 million annual budget. The Aga Khan Foundation brings together a set of international institutions whose primary mission is to develop the living conditions. It works in several fields (health, housing, education, etc.) and pays special attention to the poorest regions of the planet.